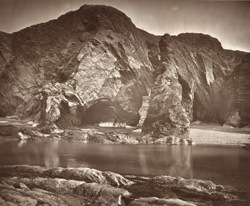 "Crookhorn Cave (so called from a crooked crag now washed away), though dry at low water, is filled by the tide each day, except during about three months in the year...Our illustration represents it as it appears at low water. The rocks in the foreground are covered by every tide, which daily bursts into the cave with a hollow sound...Passing the tors we come to the lonesome hollow of Rockham Bay, and Morte Point, a low-lying ridge of rugged rocks running out into the sea, and terminating in one ill-omened rock called Morte Stone - or death stone - fatal to many a gallant vessel. Seated on a hill overlooking the Atlantic stands the village of Morthoe. The black, jagged cliffs here rise to a height of 800 feet, displaying every variety of configuration." Text by the photographer.